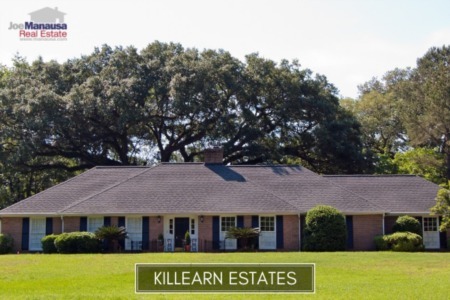 Killearn Estates is the iconic cornerstone of Northeast Tallahassee neighborhoods. It began in the 1960s with the purchase of land from Velda Dairy Farm and was the first master planned community in Tallahassee. It features underground utilities, parks, lakes and a golf course as its centerpiece. 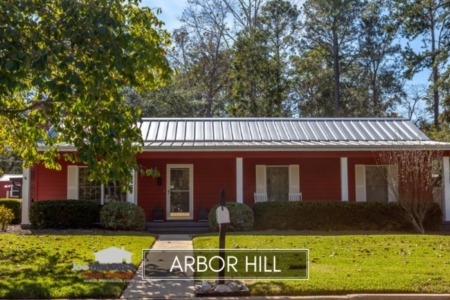 The homes in Killearn Estates were built from the 1960s to present day, though most were built 20 or more years ago. This means that there are plenty of great values (a lot of home for the money). Additionally, opportunities for buying and upgrading older homes on mature lots are an option for those wanting a newer home without the higher costs of building new today. 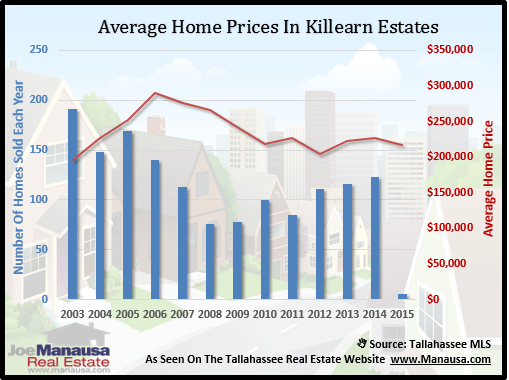 In this report, we will look at prices, values, and sizes of homes in Killearn Estates, as well as show current listings in the Tallahassee MLS and all closed home sales going back to 2002. For all of the 3 real estate graphs found in this report, you will find the number of closed home sales for each year (blue columns, measured on the left vertical axis), and an important real estate statistic shown in red (measured on the right vertical axis. It is important to note that sales are through December for all previous years, but through mid February in 2015. Average home prices rose by 2 percent in 2014 versus 2013, moving from $223,000 to $227,400. Prices have recovered 11% since the bottom of the market was reached in 2012, but still remain 22% lower than the market peak of $290,800 that was recorded in 2006. Home sales activity in 2014 was the best of the past 8 years, but still well below the levels recorded during the most active years from 2002 through 2005. There were 123 closed home sales in Killearn Estates in 2014 and there is still plenty of upside remaining for buyers. 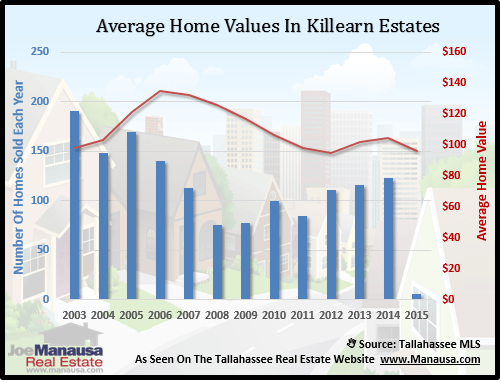 Average home values in Killearn Estates rose 2% since over 2013, the second year in a row to see appreciation since the low set back in 2012. In 2014, the average value of a home sold in Killearn Estates was $104 per square foot. This was 10% higher than home values at market bottom in 2012, but still down about 23% from the market high set back in 2006. This means that many homeowners who have purchased or refinanced in the past 8 years are still going to be dealing with negative equity situations. 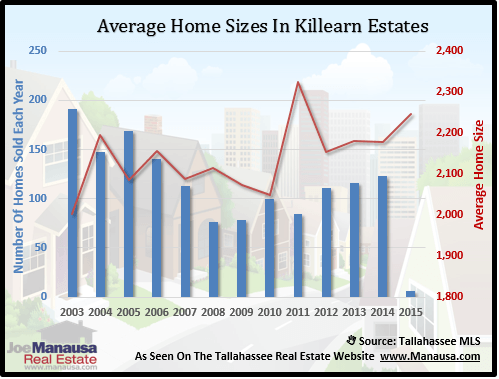 The average home size sold in Killearn Estates typically falls in a range of 2,000 to 2,300 square feet, and the results from 2014 show buyers right in the middle of this range. The 123 homes sold in 2014 averaged 2,178 square feet. The following list of homes are the most recent listings in Killearn Estates. The following list shows home sales going back to 2002 in Killearn Estates. I hope you enjoyed our February 2015 update on home sales in Killearn Estates, please feel free to drop me a note if you have questions not covered in this report.